The holy city of Varanasi, which dates back to the 11th century B.C.E., has always been a muse for artists, writers and photographers alike. Nadesar Palace, which is situated on the banks of the river Ganges, is the city's crowning glory and one of the most striking Taj hotels. The ten luxurious suites at the Palace are sure to find favor with art connoisseurs and enthusiasts. That's because works of art from the Maharaja's personal collection adorn their walls. The gastronomic experience at Nadesar Palace is delightful and begins with breakfast on the sun-kissed veranda followed by an exquisite plated meal for lunch and a poolside barbeque at dinner. Brijrama Palace is one of the oldest landmarks of Varanasi on the Banks of river Ganga and only second to Ramnagar fort, in heritage. The architecture and the design are directly influenced by the erstwhile ruling dynasty of the Marathas. The Palace is just minutes walk from the famous Dashashwamedh ghat, where the evening ceremony on Ganges (Ganga Aarti) happens every evening. The rooms and suites of the Brijrama Palace have been very tastefully done. 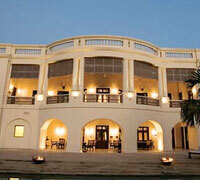 The palace has 32 such rooms that offer you a unique experience of old world charm with completely modern facilities. Guests are introduced to a delightful dining experience at BrijRama Palace. The Palace offers multiple cuisines that also include not only international but also traditional local fare in a choice of dining locations. We offer you an unforgettable Dining experience by Candlelight on a boat, along with the waters of the Ganges (on prior reservation). 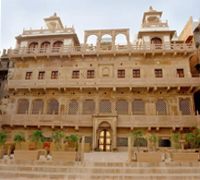 A joint venture between ITC Ltd and Jodhana Heritage, WelcomHeritage came into existence with the mission of supporting and assisting the restorations of heritage properties. WelcomHeritage represents some of the finest traditions of heritage hospitality and tourism in India. WelcomHeritage Jukaso Ganges is built on a sloped embankment called the 'Guleria Ghat' on the banks of the Holy Ganga River is typical of the riverfront architecture of Benaras. Sandstone quarried from the Chunar Area has been extensively used in the structural beams and columns of this property. The property has well-appointed rooms and most of them are east facing which provides the guest with the advantage of a river view and a soothing breeze blowing off it. Hotel Ganges View is situated on the bank of river Ganga at Asi Ghat which is among one of the five major sacred places, Pancha Tirtha, of Kashi or Varanasi. 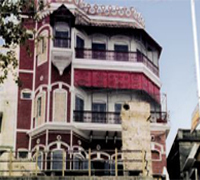 In 1990, the private residence of the Singhs was revamped into the HOTEL GANGES VIEW. Since then the Ganges View has become the haunt of scholars, poets, writers, actors, musicians, philosophers, choreographers and painters. Luxury is defined as something that is not essential but is expensive, desirable or valuable and provides comfort; we redefine luxury and make it available in your world. 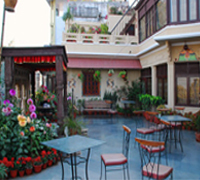 We take pride in announcing that our hotel is a great place for those who seek to find a home away from home while visiting Varanasi. The eternal beauty & divinity of this city can be best experienced from "Shiva Ganges View", Come & see the nature at its best with your own eyes. Our very peaceful rooms having panoramic sunrise view will make sure that ""Mother Ganges" invites you for an unforgettable and comfortable stay. Our rooftop is the ideal point for undisturbed Yoga, Reiki & Mediation. 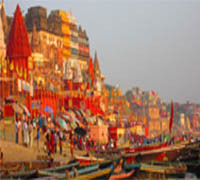 Above all, it is one of the highest rooftops along the bank of river Ganges giving you a wonderful circle view.